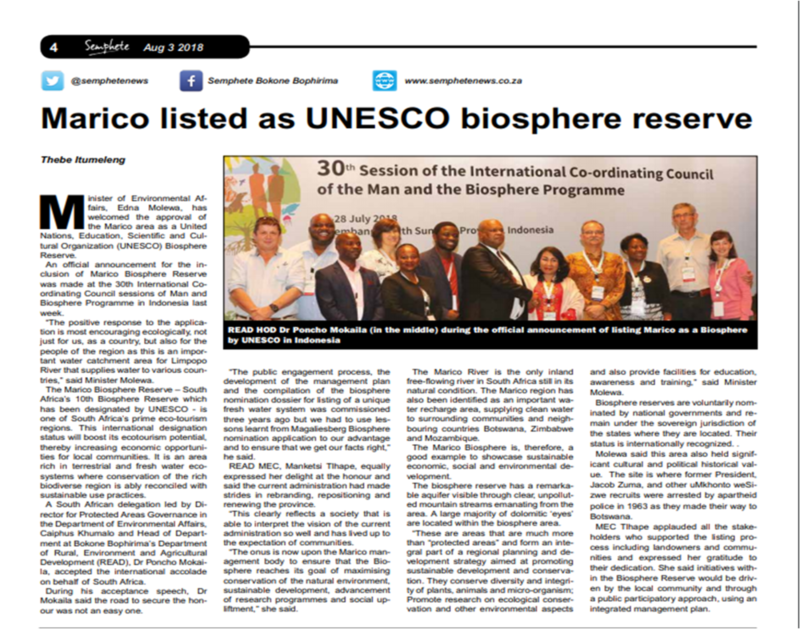 The people of the Greater Marico are very excited about the fact that the Marico Biosphere Reserve was officially designated by UNESCO on the 25th of July 2018 at the International Man and the Biosphere Conference in Palembang, Indonesia. The high buy -in from private landowners, whether they own a stand in town or a farm in the area, is apparently exceptional to the norm of international biosphere reserves. Marico Biosfeer Reserve Land Owners Conference. Die Marico Rivier Bewaringsvereniging het op 12 April ‘n konferensie vir Grondeienaars wat binne die voorgestelde Marico Biosfeer Reservaat val, aangebied. ‘n Verskeidenheid relevante onderwerpe is deur uitgelese sprekers hanteer. Daan van der Merwe, Chairman of the Management Authority elaborated on the importance of protecting the dolomitic aquifer systems and rivers from overuse and other exploitation. The measure and period of stress that the system will have to absorb will have an influence on the capability to recover naturally. Ons as verbruikers van die sisteem het dus ‘n groot verantwoordelikheid om hierdie bate te bewaar en die laste wat daarop impakteer te verminder en sodoende geïntegreerde waarde vir die gebied te skep. Prof Hendri Coetzee van NWU het terugvoering gegee oor die sosial-maatskaplike navorsing wat gedoen is in die Biosfeer Reservaatgebied. Oor die algemeen blyk dit dat inwoners positief is oor verblyf in hierdie gebied. Mediese dienste, Onderwys en Veiligheid is faktore wat wel kommer wek. Francois Fouché from the NWU Trade Research Advisory, described “tacit knowledge” as a crucial skill to ensure economic growth. Traditional job creators, like mining, is becoming outdated to a great extent. It often has a negative impact on the environment and most precious resources like water. The growth in mechanisation results in a decrease in job creation. Tourism may be seen as the best possible job creator for this region. Prof Alexander Paterson van UCT explained the Legal Framework of the Protected Areas Act and the advantages of the Biodiversity Stewardship Program for land owners. Declaration of land as Nature Reserve ensures the highest form of protection against unwanted external activities. Prof Leon Jackson het die uitdaging tot die gehoor gerig om enige vorm van ‘verandering’ volgens bepaalde beginsels te bestuur. Die individu kan daarop fokus om bedreigings in geleenthede te omskep en voordeel (bates) te bewerkstellig deur ‘n positiewe benadering tot verandering. Konferensiegangers het groot waardering betuig vir die inhoud van die aanbiedings en die wyse waarop die geleentheid hanteer is. The bottled water was sponsored by the farm Monelieschke at Molemane Wetland at Ottoshoop. An Artesian well feeds the wetland. This water received a Gold medal for its class at the International Fine Waters of the World competition in China in 2017. The MRCA wants to acknowledge and congratulate the team that was involved in the arrangement and execution of the event. Invasive Koi fish or indigenous Yellow fish. Which do we prefer? Alien fish in our precious water!! Landowners need to become aware of the presence of alien fish species in our rivers or furrows. The Marico River is, up to the town’s sewerage system, classified as being in an A/B class according to the DWS Resource Quality Objectives classification system. It is also a flagship river of the National Fresh Water Eco-systems Priority Areas. Does it make sense to release alien fish where it does not belong? We all know how quick our rivers flood after good rains. Therefor landowners farming alien fish should take proper care of their breeding system to prevent spillage into the streams and rivers. Ons almal weet hoe vinnig die riviere in vloed kom na goeie reëns. Grondeienaars wat met uitheemse vis boer behoort behoorlik voorsorg te tref dat hul damme nie oorspoel in die riviere en die uitheemse vis daarmee saam nie. Landowners utilising the furrow network are supposed to clean/service the furrows by April each year. How many fish eggs or small fish are thereby just scooped onto the river bank? What about negotiating for a better time of the year when fish is less vulnerable? Kom ons neem verantwoordelikheid vir hierdie skaarser wordende gawe van water wat ons ontvang het en verseker dat ons doen en late voordelig vir die omgewing en onsself is sodat ons nog vir geslagte die vreugde en voorspoed van ons omgewing kan deel. Voorbereiding vir die Brandseisoen. Preparation for the Fire season. Marico Rivier Bewaringsvereniging (MRB) koop ‘n vuurvegter aan vir gebruik in die Marico Biosfeer Reservaatgebied (Marico BR) asook in die verantwoordelikheidsgebied van die Ramotshere Moiloa Munisipaliteit se Brandbeskermingsvereniging (RMLM FPA). Die MRB wil egter, met opregte dank, meld dat die NWK tak van Skuinsdrif ‘n groot afslag vir die vuurvegter beding het. Daarsonder sou die baie nodige vuurvegter, ‘n groot hap uit die begroting gevat het. Land owners are encouraged to become members of local Fire Protection Forums in order to be more prepared for the coming Fire season. It is to the advantage of the land owner to be a member of such formal government supported structure. Fire fighting training for is planned to take place before the start of the Fire season. Grondeienaars word aangemoedig om by plaaslike Brandbeskermingsforums aan te sluit of om sodanige forum te stig sodat grondeienaars beter voorbereid en paraat is vir die naderende brandseisoen. Geakkrediteerde Brandbestrydingsopleiding word ook beplan voor die aanvang van die brandseisoen. Besonderhede sal op verskeie kanale deurgegee word. Die Ramotshere Moiloa Plaaslike Munisipaliteit se Brandbeskermingsvereniging (RMLM Fire Protection Association) is op 14 Sept 17 geheraktiveer te Groot – Marico. The purpose of the RMLM FPA is to form the link between Fire Protection Forums (FPFs) in the RMLM area and the Provincial Departments responsible and involved in fire protection; more specifically veldfires. A committee was formed consisting of representatives from the 3 presently functioning FPFs in the area and the Marico River Conservation Association (MRCA). The Department of Agriculture, Fisheries and Forestry (DAFF) is directly involved in a supervising and supportive capacity. The RMLM FPA plans the training of three teams that can be made available to members of Forums for fire fighting and making of fire breaks (at fair cost). Training is accredited. Persone wat belangstel om enige van bg opleiding by te woon kan met ons in verbinding tree. The Marico River Conservation Association and the Marico Biosphere Reserve Initiative is a Mail & Guardian "Greening the Future" awards winner. The Sudley Adams Memorial Award has been awarded to the MRCA and Marico BR Initiative for its strive to preserve the pristine headwaters of the Groot Marico, Klein Marico and Molopo rivers. The MRCA sees this as a very positive start for the Biosphere Reserve application that was handed in at UNESCO on 30 September 2017. The process started on 7 March with a meeting for the co-owners of the Molopo Private Park. The owners are in the process of applying for Nature Reserve status in terms of the Protected Areas Act. There after the senior school kids of the Ottoshoop Primary School were introduced to the biosphere reserve concept and the area covering the Marico Biosphere Reserve (MBR). The community of Ottoshoop fall in the Transitional zone. On the 6th of April the Ottoshoop community from the informal settlement gathered for a presentation. Before they were able to endorse the Biosphere Reserve, they were suddenly sent home by a heavy thunder storm. 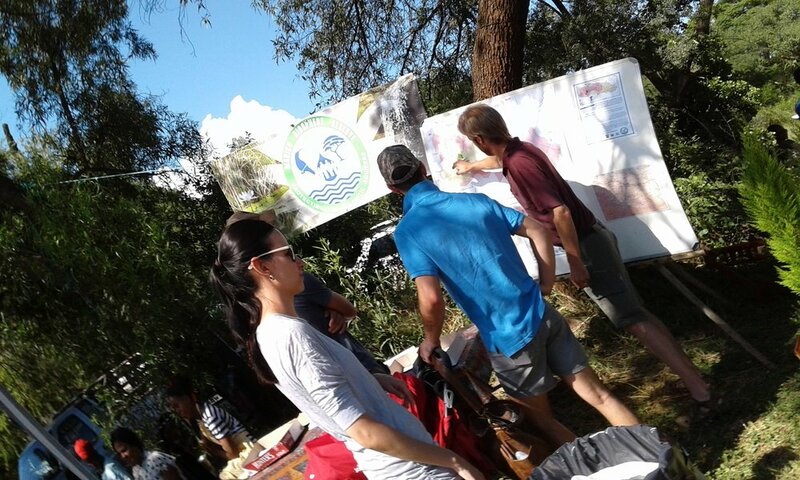 The Land owners of the Marico Protected Environment gathered in Pieter Mans’ lapa on 11 March for a presentation on the proposed Marico Biosphere Reserve. The greatest part of the Marico Protected Environment will be endorsed as Core Area of the Marico Biosphere Reserve. 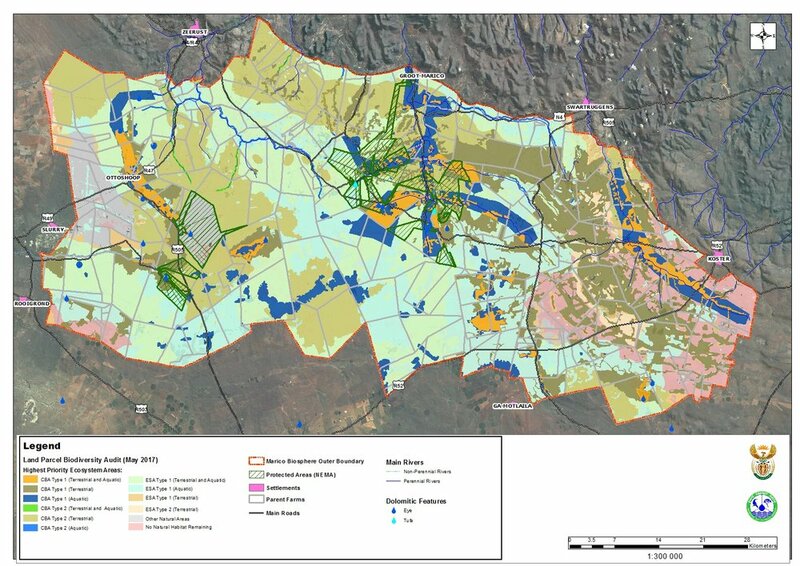 Land owners of the Groot Marico area attended a meeting on 31 March whereby the Area delineated into the proposed Core, Buffer and Transitional zones was explained. The importance of water from the dolomitic aquifers and the high bio-diversity got special attention through the maps on Critical Biodiversity Areas. Community Leaders of Groot Marico were invited to attend a presentation done by an official of the Department of Rural, Environmental and Agricultural Development on 5 April. The transparency of the process as well as the possible influence of mining on the water and other environmental resources was discussed additional to the presentation of the MBR. The MBR had an open day for the proposed reserve at the Bosveldfees in Groot Marico on 15 April. Land owners had the opportunity to raise questions and support the Initiative by endorsing their land or through general endorsement. No less than 1 500 people were exposed to the Initiative by means of regular announcements, the distribution of pamphlets and the MBR display. Fire Season! - The Marico Biosphere Reserve? With the winter already in the air the Provincial office of the Dept of agriculture Forestry and Fisheries (DAFF) requested the MRCA to become the implementing agent of the Ramotshere Moiloa Local Municipality (RMLM) Fire Protection Associaton (FPA). This means that the MRCA will act as link between the different Fire Protection Forums in the area and DAFF as well as the surrounding FPAs. This will enhance the combatting of veld fires in the MBR to a great extent. Due to the devastating fires we experienced last year, the Bokkraal and Rietvlei roads were washed away after heavy thunderstorm.. Therefore there was hardly any vegetation to brake the speed and force of the water storming down hill. Veld fires also cause the degradation of land.